Check out what’s happening at the United Nations Department of Economic and Social Affairs – click the image above for their August 2013 newsletter. The United Nations Department of Economic and Social Affairs (UN DESA), for example, offers opportunities to learn about and get involved in global dialogues dealing with development, capacity building, and trends and analyses. This month’s newsletter discusses issues that range from the confluence of food, energy, and cities to measures of sustainability. Check out the newsletter here. Also, as a part of this year’s celebrations, youth from around the world are invited to participate in an event with UN Secretary General Ban Ki-moon (see program below). I will be attending; if you are between the ages of 15 and 29 and would like to accompany me, let me know immediately so we can get you registered. Email me at: alex.woodward[AT]subudyouth.net. 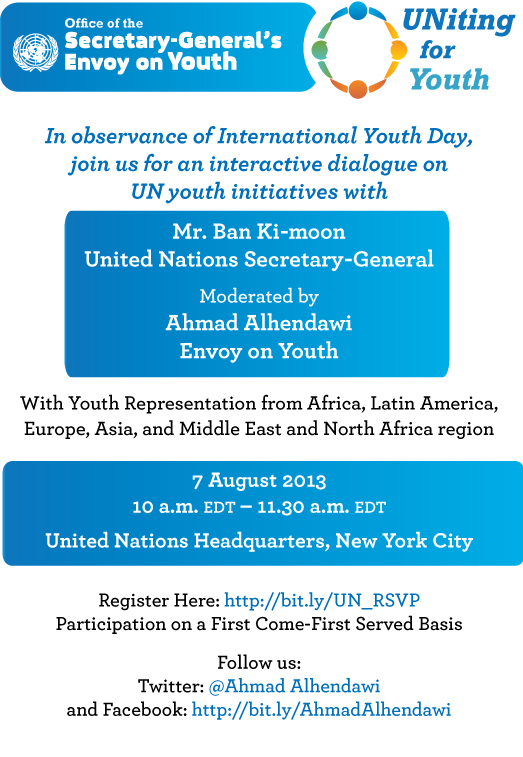 If you’re in the area, join Alex on Monday, 5 August in an event with UN Secretary General Ban Ki-moon!